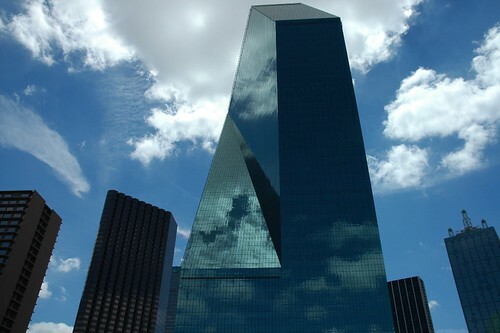 Following is the photograph that was selected; a picture of Fountain Place in downtown Dallas- this unique skyscraper was designed by I.M. Pei and Partners who also designed One Dallas Center, Energy Plaza, and the Dallas City Hall. It was a 60 degree day in Dallas and I could not resist those beautiful clouds just dancing around the sky. I hired a cab for about 4 hours (yes to take snaps around downtown Dallas) and I spent about 20 minutes in the parking lot next to this beautiful building, to capture the reflections that would accentuate the unique angles of the building.